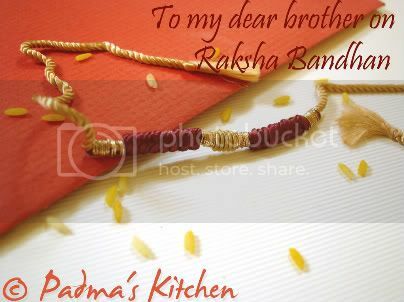 Raksha Bandhan is a festival celebrating the bond of affection between brothers and sisters. The day when the siblings pray for each others' well being and wish for each others' happiness and goodwill. As the name 'Raksha Bandhan' suggests, 'a bond of protection', Raksha Bandhan is a pledge from brothers to protect the sister from all harms and troubles and a prayer from the sister to protect the brother from all evil. Raksha Bandhan was on 16th August 2008. The festival falls on Sravana Poornima (full moon day of Sravan month) which comes generally in the month of August. The sisters tie the silk thread called rakhi on their brother's wrist and pray for their well being and brothers promise to take care of their sisters. The festival is unique to India, creates a feeling of belongingness and oneness amongst the family. On the occasion of Raksha Bandhan, I am dedicating this post to my brother. Though staying so far from my brother I miss him so much and all the good times spent together. 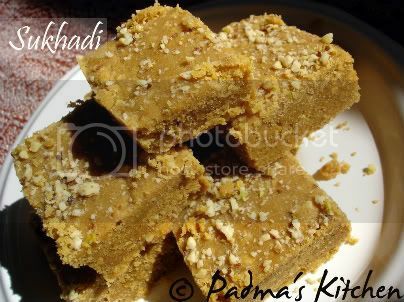 For this occasion I made special sweet called "Sukhadi" I learned from my very good friend Bhavana Bhabhi. 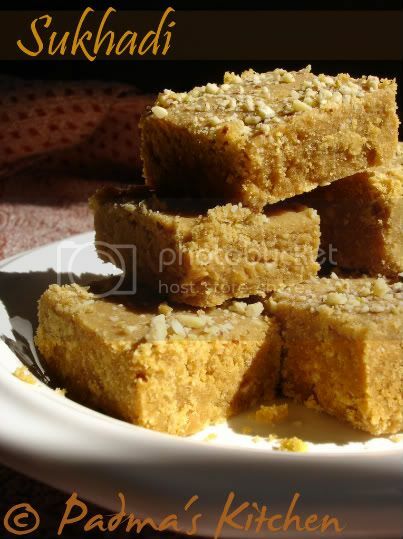 This is a Gujarati specialty sweet made from whole wheat flour. 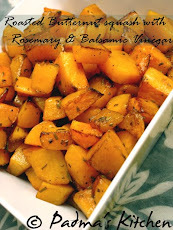 This is very easy to prepare and ready within minutes. I can say effortless cooking! Grease with ghee or clarified butter a cake pan or some thali like I used in the picture photo. 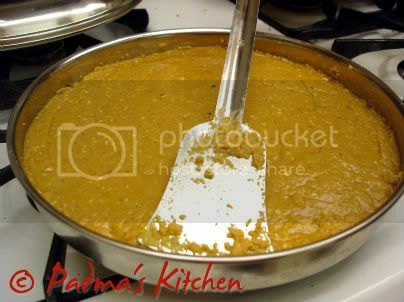 Melt ghee in a deep pan or kadai. Add whole wheat flour and stir continuously till you smell the aroma of cooked wheat flour. 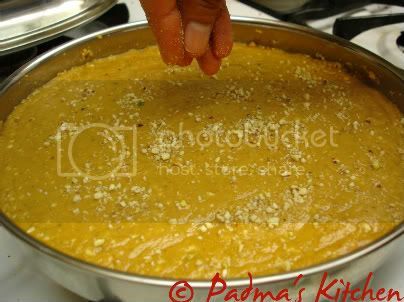 Add grated jaggery, cardamom powder. 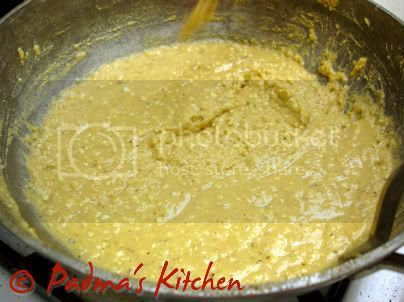 Stir constantly till the jaggery melts and ghee leaves from side of kadai approximately for 10-12 mins. Once its done transfer it to previously greased round cake pan or thali. Press it firmly with a spatula. Sprinkle with your favourite finely chopped nuts like cashew nuts, almonds, pistachios, walnuts. Cut it diagonally or any shape you like while the sweet is still hot and cool it. Store in an air-tight container, this will last up to a month but in my home we finish them off in two days! Thanks Bhabhiji for teaching me this incredible yet simple recipe! I've not tasted this before but it looks delicious and what fabulous pics Padma - the first 2 are breathtaking!! Looks lovely. Never had this before. Reminds me of mysore pak. Thanks. However can you please let me know when do you add the jagery. I have read the recipe twice and I dont see that particular step. Thanks Padma for the super fast response. Gorgeous! There are so many Indian sweets I have yet to try, but so far I love them all. 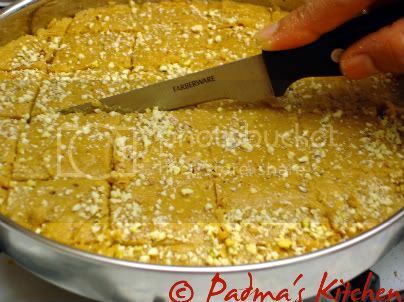 As Aparna mentioned, the look and method seems very similar to mysore pak, which I adore. So good to see you back, Padma. Hope you are doing well. sweet excellent ga undhi,proceedure antha mysore pak lage undhi,kani godhuma pindi tho chesaru,health ki manchidhi.. I tried this sweet.But,its very dry while cooking.its not watery consistency, as you have shown in the pictures.Why?PLZ reply me. You might need to add more ghee while frying the wheat flour! !